There’s only so much foundation can do… whilst I’ll happily pile on the makeup, a truly enviable glow tends to come from well-nourished and looked after skin; here’s my pick of the best glow-giving skincare for the party season. After a long week of one too many post-work drinks, I basically need to do a face mask or two at the weekend… to save my face. I have raved about the glorious Peter Thomas Roth Pumpkin Enzyme Mask, and I think it’s amazing for giving skin a lift and adding some serious glow (plus it smells divine). For something more decadent (and festive! ), I love the 24k gold mask as well. So luxe, and it’s designed to impart luminosity into the skin as well as soothing everything. I think gold as an ingredient is a little dubious given its lack of scientific backing but with ingredients including hyaluronic acid and glycerine it definitely leaves everything silky smooth. To start off my day-to-day, I’ve been loving the Purelogical Cellular Renewal Face Wash to cleanse the skin. It’s a great, light cleanser to use in the morning to freshen the skin up, and te texture doesn’t feel heavy in the slightest. I like to just massage the gel in, leave it on the skin for about a minute and then rinse off with a flannel – easy. Packed full of AHA acids and enzymes, it gets to work smoothing out the skin and leaving your complexion perfectly smooth and glowing. Delving deeper into the brand of the moment; The Ordinary Advanced Retinoid 2% is something I’ve been tentatively incorporating into my routine. Used once or twice a week at night really speeds up skin-renewal, without leaving skin feeling stripped or sore. One to add into mix if freshening up your complexion is a priority. 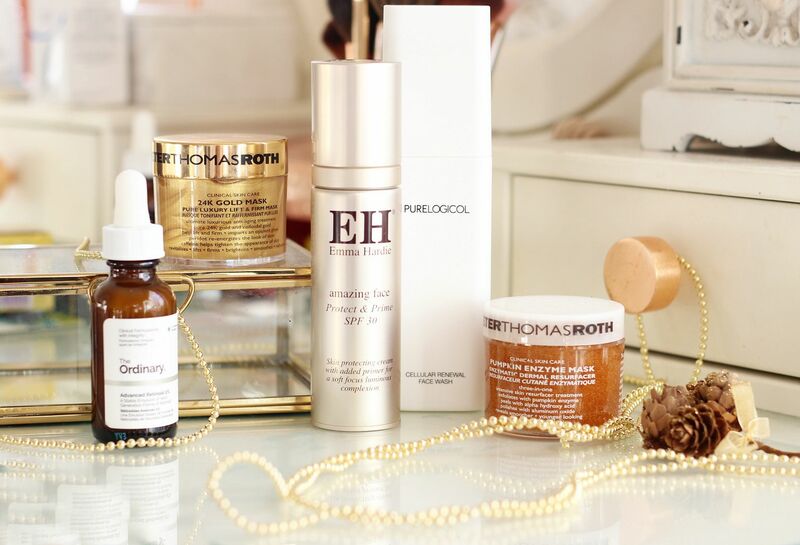 One of my favourite bases to use under makeup is the Emma Hardie Protect & Prime; a deliciously light yet hydrating cream that leaves skin supple. It sinks in quickly, and helps foundations to glide on over the top. Emma Hardie skincare can basically do no wrong in my eyes because my skin really seems to love every product I use, but I like this one especially for adding some lovely glow to the skin.